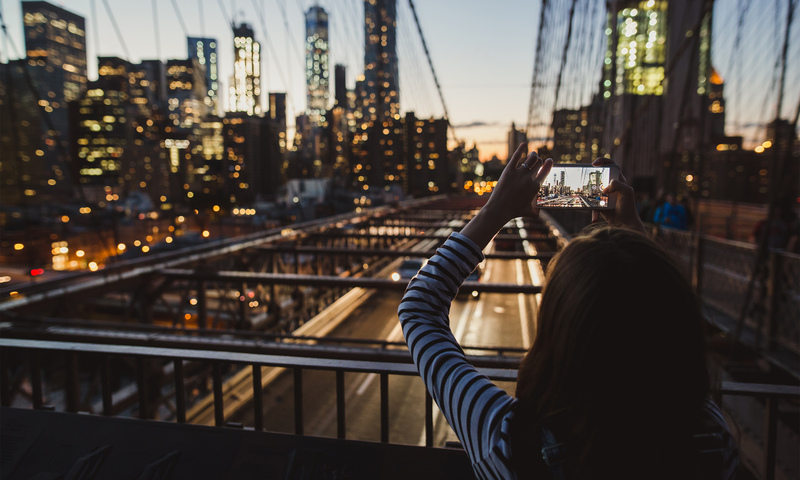 Any ‘grammer worth their likes has paid a visit to the Big Apple — and it shows: New York is the most Instagrammed city in the world. Discover the Gotham City sites your feed needs and some tips to help your shots stand out. Sheep’s Meadow and the Central Park Zoo are photogenic, but Bethesda Fountain is Instagram’s favorite spot in Central Park. Take your pic looking out from the Terrace for added contrast between light and dark. The bright lights and chaotic crowds in Times Square offer a visually striking scene. A touch of saturation will emphasize the intersection’s incredible neon lights. It’s easiest to enter Brooklyn Bridge’s Pedestrian Path from the City Hall entrance in Manhattan, but make sure you turn around to take advantage of the city’s epic skyline. The Guggenheim (422,664), Met (175,387), and Whitney (167,718) come close, but MoMA is the crown jewel when it comes to museum Insta-popularity. The peaceful sculpture garden is a wonderful spot to get inspired. Beyoncé fans know that Luna Park’s real magic starts when the sun sets. While you’re there, check out Coney Art Walls, an outdoor museum perfect for boosting your street art photography cred. The High Line – an elevated railroad turned park – only opened in 2009, but it’s already one of the most Instagrammed spots in New York. We can’t all get an aerial shot like @timothyschenck, but the park looks beautiful from just about any angle. Greenwich Village and Union Square are obligatory downtown stops. Complete your tour at nearby Washington Square Park, which has 200,352 hashtags itself. This iconic triangular building was one of the tallest in the city when it was finished in 1902. Head to Madison Square Park and angle your camera slightly upward to make the building look even more impressive. The giant constellation mural adorning Grand Central Station’s ceiling is prime Instagram bait. Download a fish eye lens app for a unique, panoramic view that varies your feed. Architect Santiago Calatrava opted for a futuristic vibe with Oculus, the shopping mecca in the new World Trade Center transit hub. Since opening in March 2016, the massive white ribs and marble floors have become a social media sensation. Sightseeing is sure to build your following, but don’t forget about New York’s favorite Instagram subject: food. From New York classics like pizza and bagels to new crazes like cronuts, mac and cheese spring rolls, and nitrogen ice cream, you’re sure to get some Insta-worthy shots as you nom. For more NYC eats inspiration, check out some of the best foodie accounts in the game, like New Fork City, City Foodie, No Leftovers, and Eating NYC.